You walk out to your driveway and there your Indian motorcycle sits, gleaming in the sun, the luxurious paint job sparkling as you throw your leg over the bike and sink into the soft brown leather seat. And the Thunderstroke engine roars to life, its throb shaking the pegs and thrilling your soul, speaking to something at the core of your being. 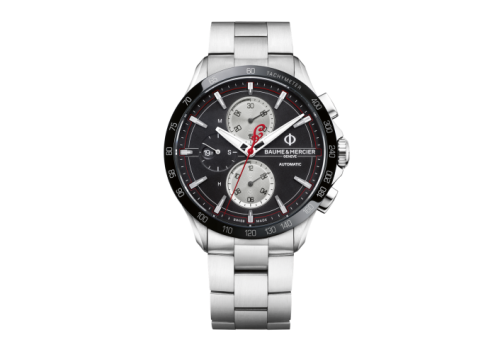 You give one last check to the Baume & Mercier timepiece on your wrist, your companion for this and other adventures, and open the throttle. The promise of the road ahead is something powerful for motorcyclists. What lies around the next bend begs to be explored, the view from the top of that mountain needs to be seen, the dinner and drinks with your fellow riders after a long day of riding beckons. 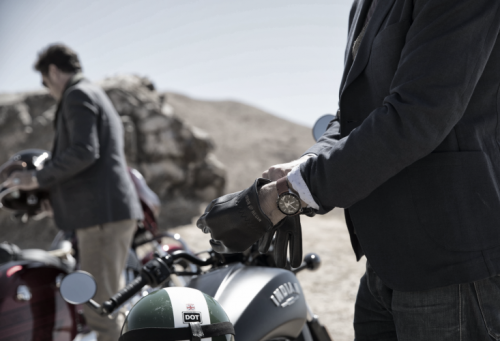 There is a definite spirit of adventure when you sit in the saddle and start that powerful engine. As you ride, you and your motorcycle become one, and together fuse with the road. The act of taking the time to ride through unique landscapes is an exhilarating experience and feeling. Riding alone is like meditation, the concentration on actually operating the motorcycle reduces outside problems to specks and allows your unconscious mind to find solutions and see things in a “big picture” way. Riding a motorcycle opens your mind while demanding your full attention. The sights and smells are more vivid, more immediate, impossible to miss. Riding motorcycle with friends brings you closer together, sharing the experiences, hardships and triumphs. Crossing the country on two wheels, with friends around you is a complete different experience than any other. The adventure forges a connection on a deeper level. Like cowboys in the Wild West, riding a motorcycle is an adventure every time you start the engine and open the throttle. You don’t know what is around the next corner, and motorcyclists want it exactly that way. 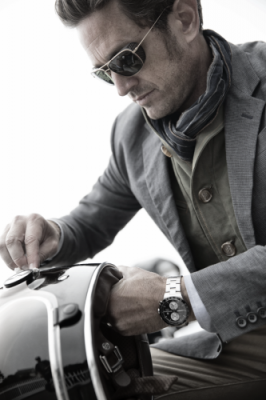 Mechanical watches and motorcycles go hand in hand. Tiny marvels, Baume & Mercier mechanical watches are engines on your wrist, engines that run 24/7 and are powered by your everyday movements. Knowing you have a mechanical watch on your wrist while riding with a Thunderstroke engine powering your Indian motorcycle just makes sense. 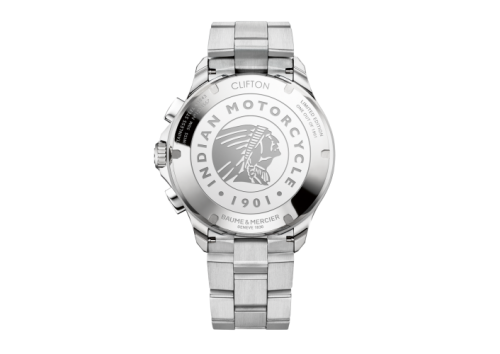 Baume & Mercier’s Indian-themed timepieces are engineered for people who want more out of life -- every time you mount your Indian motorcycle wearing your Baume & Mercier timepiece, you are creating an unforgettable memory. No matter what you are doing on a motorcycle, whether you are commuting to work or starting a ride around the world, it’s about pleasure. Motorcycles are dream machines, capable of transporting you into a world of adventure, even on your commute to work. Imagine the sensation when you are heading out for a trip, your saddlebags packed, your goodbyes said, now all you have to do is ride. It’s just you and the road, the undulations of the tarmac touching you where you live, your soul singing as you ride through the mountains, carve the canyons, cruise the coastline. Riding a motorcycle connects you to the land you are riding through. You are feeling the vibrancy of their lives as you ride through. People turn their heads as you ride through, the tires thrumming with every bump and dip in the road. 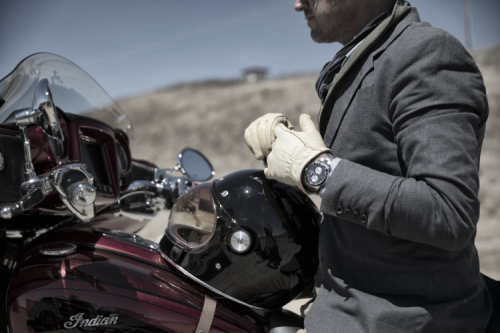 The Indian Scout model, which inspired one of the Baume & Mercier limited edition timepiece, delivers a consistently outstanding riding experience, whether you are having an epic and adventurous journey, or an urban cruise. On a motorcycle, the everyday world almost ceases to exist. You can’t answer your phone, you can’t drink a cup of coffee, you can’t afford to be distracted by every day cares and woes – you have to be mindful while riding, paying attention to everything happening around you. And what journey it is from the saddle of an Indian. A heritage brand of motorcycle with more than 100 years of history, the Indian head logo has seen just about everything, from racetracks to “Wall of Death,” wars to endurance races, land speed records and Toys for Tots runs, and everything in between. Indian motorcycle today share that heritage and are committed to taking it even further, making lives memorable and worth living. 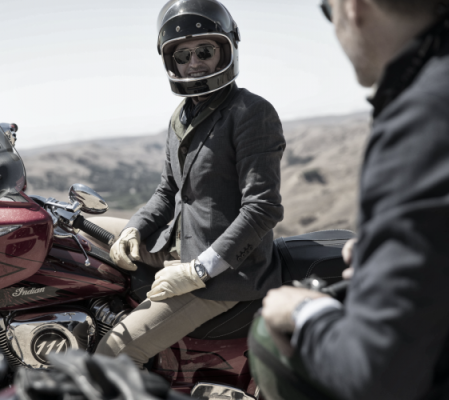 Whether you are riding an Indian Scout or a full-dress Chieftain tourer, you are part of the lifestyle and part of the adventure. 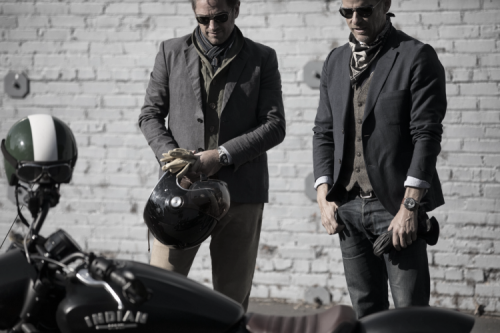 Baume & Mercier has partnered with Indian Motorcycle to produce timepieces that capture the spirit of these two great brands, and the feeling of the open road. 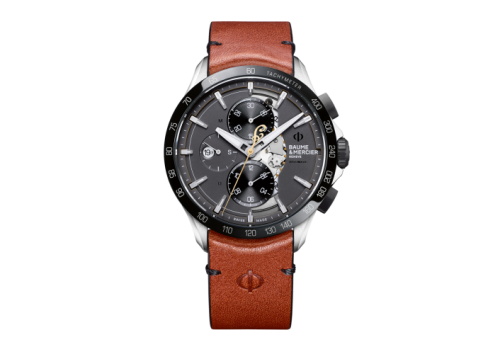 Baume & Mercier uses subtle design cues, like the open-worked dial inspired by the Indian’s Scout midsize bikes and the shape of the cylinder heads of the famous V-twin engine to distinguish the watches and capture that spirit of freedom and ultimate pleasure. 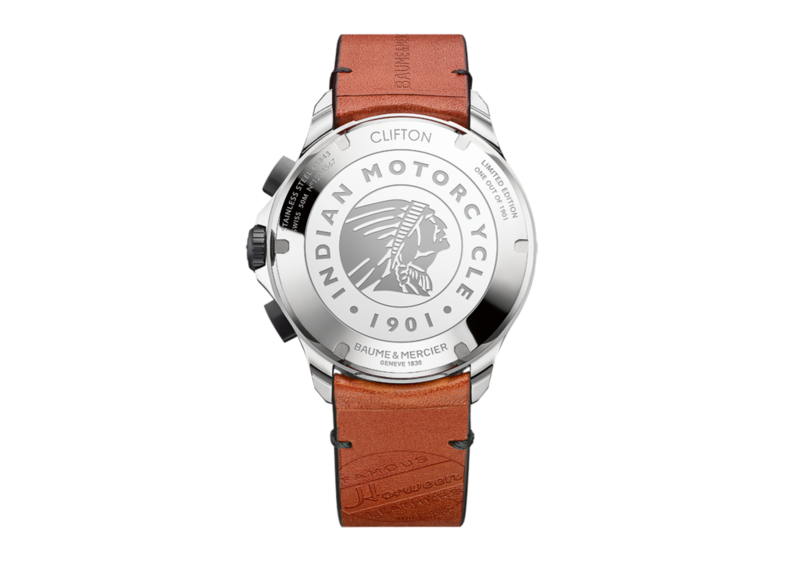 The Indian Motorcycle Company is a heritage brand with more than 100 years of experience making some of the finest motorcycles on the face of the earth, and Baume & Mercier predates Indian by 71 years. 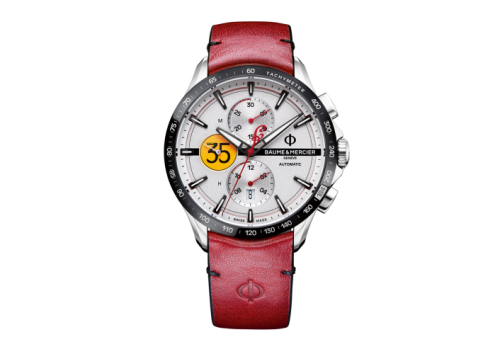 Both companies are committed to transmitting their traditional codes – high quality, attention to detail, innovation and passion – while pushing the lifestyle to fullest. 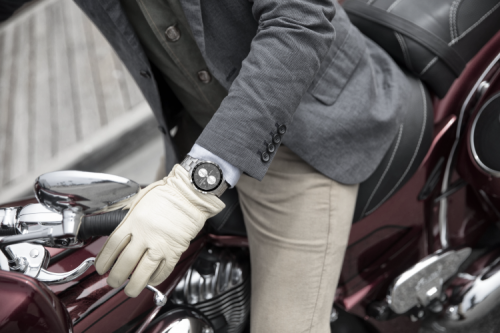 Motorcycling is about unforgettable moments, and with a Baume & Mercier Indian timepiece on your wrist as a witness, these moments are even more memorable. 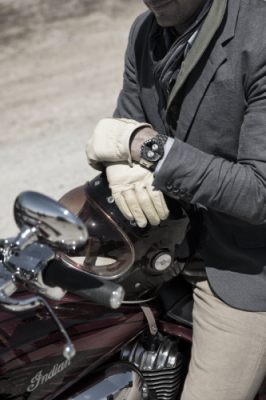 Whether you are crossing the USA on Route 66, riding down to Key West, following the Great Wall of China or riding the passes in the Alps, your Baume & Mercier Indian timepiece is the perfect companion for all your adventures.